St. John's Newfoundland back to Nova Scotia to Murphy's Cove. June 19th 2011, day 36. We left Pippy Park in St.John's to drive back to the ferry terminal at Port aux Basques. So far we had driven 10,740 km since we left Victoria, BC. We were on the road early morning and it was 7 C with sun and clouds. We arrived in Corner Brook and set up camp in Kinsmen Prince Edward Park. Both of us a bit tired and ready for supper. It was a long day with an additional 700 km added to the truck and trailer. Taking turns driving makes the trip much easier. The Corner Brook campsite was in an open field, the wooded sites were all booked by a caravan coming in. The wind and the rain were by then really pounding us. June 20th, day 37 of our journey. We did not sleep that much, the wind and the rain were rocking us all night. Over coffee we checked the forecast on-line. The warning was for "Wreck House" winds. These are winds with gusts over 200 km / hr. Check out this video I found on-line. The wreck house winds actually blow semi trucks off the road. More on Wreck House winds. It looked like we might have to stay here for a while. 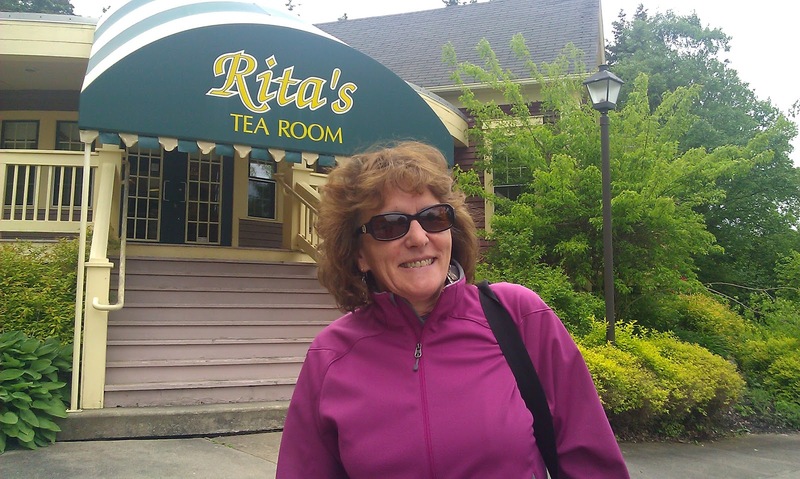 We had to be in Halifax to pick up Liz's sister Annamarie on the 25th of June. We called the ferry terminal in Port aux Basques, they told us it had calmed down there and the ferries were running again. Next we had to drive into this huge big building "Canadian Food Inspection Agency". They wanted our potatoes and carrots, anything that has been grown in soil. We did not have time to ask why, just take the potatoes (they were bought on NL but grown in PEI). The sailing across the Cabot Straight was pretty bumpy and rolling. Liz had her traveling bands on, and I was doing OK, just a bit pale but surviving. Terra Firma!! We arrived in North Sidney NS and we drove off the ferry with a "forced" smile. Again we camped at the Cape Breton KOA campground in New Harris, fired up the BBQ and had supper at 9 pm. Tuesday the 21st of June, day 38. We left New Harris in brilliant sunshine. We decided to drive the coasts of the Bras d'Or Lake (which are actually several inlets of the ocean). We took Hwy 223 to Chrismas Island and then north to East Bay. Beautiful country-side and scenery along the first half, but the south side looks a bit neglected. Later, south on Hwy 4 we stopped at Rita MacNeil's Tea Room just past Big Pond. Lunch will only be served after the 24th of June so we had tea and cookies. In Port Hawkesbury we shopped at Sobeys and got some fresh supplies. Had lunch in the camper in the parking lot after we cleaned up the mess in our fridge... the lid on the jam was not on properly and was originally sitting on the top shelf of course. It made a royal, mucilaginous, gooey mess. By the way, Sobeys has some great frozen hamburgers "Sensation by Compliments". They are super good and we put them frozen on the hot BBQ, 4 minutes on each side.... Done!! So easy to do and really good. They have several types under this brand. After we crossed the causeway at Canso we headed south on Hwy 344. Ouch, lots of pot holes, lesson learned, if the tourist books do not mention a certain area, don't go there or be very careful. Lobster fishing off the shore at the Sea Breeze Campground. "Shaken not Stirred" we arrived at Sea breeze Campground and Cottages. Beautiful but windy. The next morning the "Sea Breeze" was still going strong and with some rain to boot. We drove into the little town of Canso. Canso is on the north-eastern tip of mainland Nova Scotia, on Chedabucto Bay. The Canso area was established in 1604, along with Port Royal, Nova Scotia. The British constructed a fort in the village in 1720. Canso is of national historic importance, reason being it was one of only two British settlements in Nova Scotia prior to the establishment of Halifax in 1749. Canso also played a key role in the defeat of the battle over Louisbourg. Today, the town attracts people internationally for the annual "Stan Fest" or Stan Rogers Folk Festival. Canso must have been beautiful back then, we looked at all the wonderful old homes as we were driving along the streets. We seen an old building, "The Cable Station". The Cable Station was an important link in relaying news of the Titanic sinking from Cape Race, Newfoundland and Labrador, to New York. The cable station building still stands, it looks abandoned and in some disrepair, however structurally the exterior probably looks much like it did in 1912. Around the corner, a fisherman was selling Haddock out of his truck for $6.00 / lb. It does not look rough in the picture, you should have been there. We were soon at a snail's pace on Hwy 315 towards Goldboro, traveling west along the coast. The road is so bad the grass is 6 inches high growing out of the cracks in the pavement. Not sure what these poor people have done to the government to be neglected like this. It took 2.5 hours to drive 55 km. All of a sudden, end of the road, take the ferry? Where? Across the bay: $5.25 - running every hour. - We arrived across the inlet. The road after the ferry crossing is in better shape and we arrived at Murphy's Camping By The Ocean in Murphy Cove. We booked in for two nights, we needed a rest. 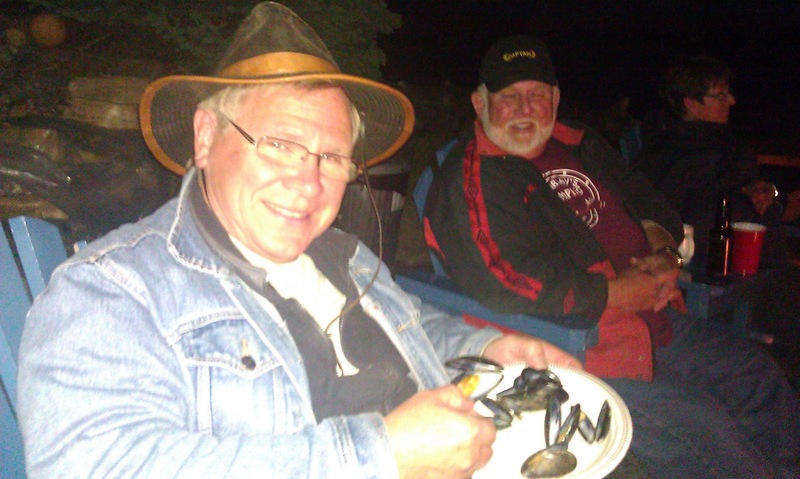 Great campground with fantastic owners, Brian and Marilyn Murphy, they even sit with their guests around the campfire at night and serve complimentary steamed Mussels (steamed in beer and lemon pepper), everyone welcome. Life is good!! Anders enjoying mussels. Brian and Marilyn in the background. 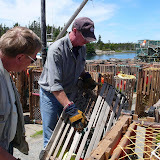 Anders and two brothers who are local lobster fisher men. Lobster was for supper that night and of course a visit to the common campfire. Really good idea, you get to know all the people and their stories (or at least some of them) in the campground. Nature at it's best in Murphy's Cove Campground on the Ocean. Wonderful evening, with more stars in the sky then I have seen in a long time. For more pictures on this part of the trip, check out our Picasa Web Album.